Obviously the main feature is the slimline metal server which i ordered from Simply Home and which i absolutely love!! It was nicely priced (you can take a look at them here) and there’s space for storage but its lean lines lends itself to being kept clear of clutter. 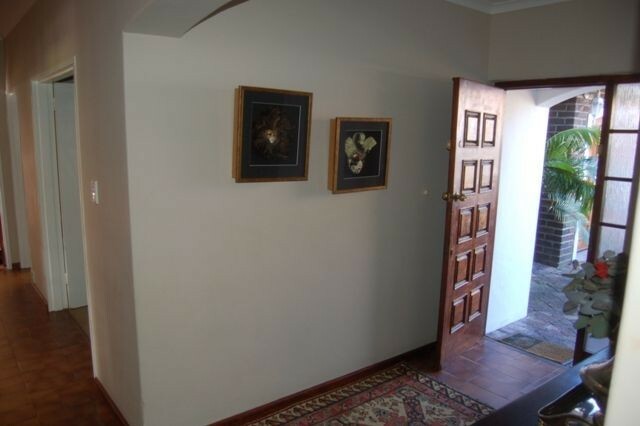 If i needed some space i might pop a basket on the middle shelf but i tend to leave a basket on the floor and ask the kids to put their shoes in there rather than traipse dirt through the house. 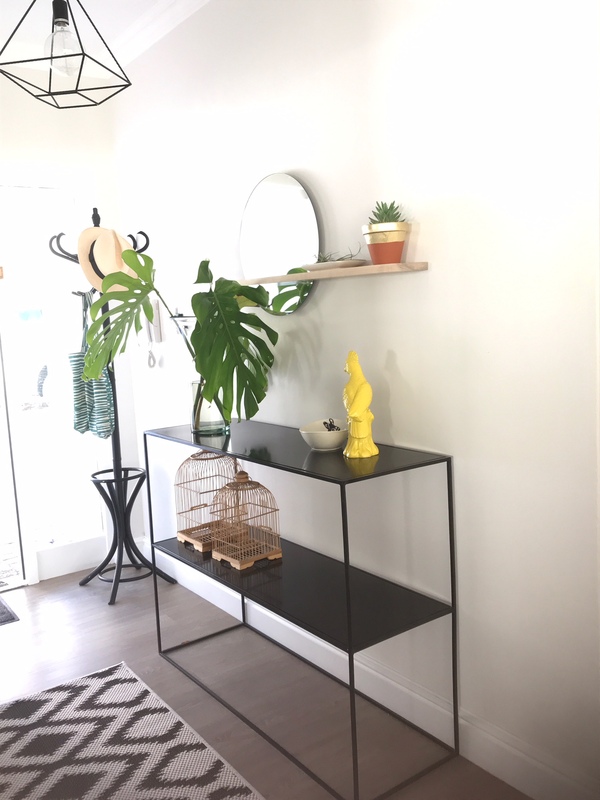 The Shelfie is from Airloom – i am mad about it and am very proud that mine was their first order! The round mirror, unassuming ash shelf and perfectly in-proportion size all work for me – a classic in the making. 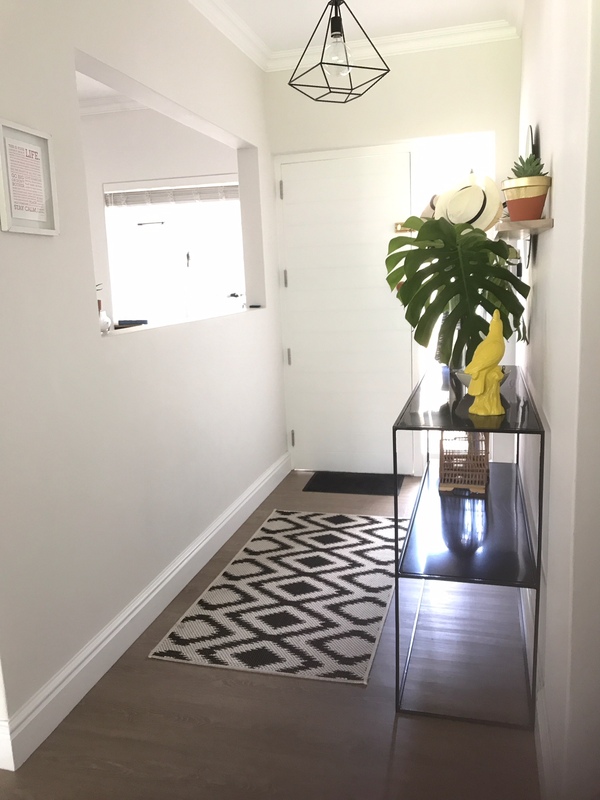 The rug is also from Airloom – it’s from their Inside Out range which means its waterproof which is great for muddy shoes and heavy traffic – it’s also very nicely priced (i bought it on sale for R300) and the pattern is so lovely and graphic. 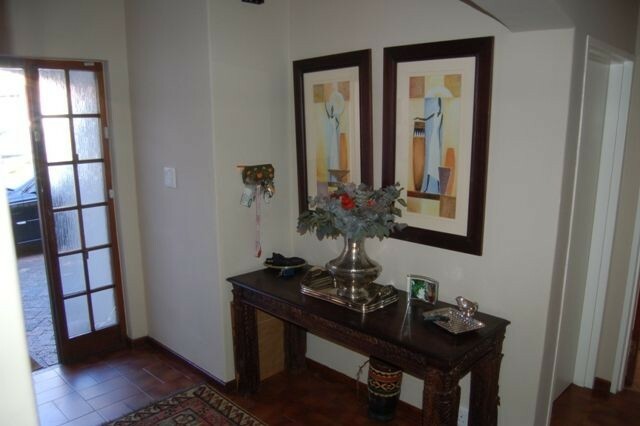 I found the coat stand on Gumtree for R250 – it doesn’t always look like that, in fact it’s usually completely overrun with bags and coats until The Captain gets a bee in his bonnet and empties it! 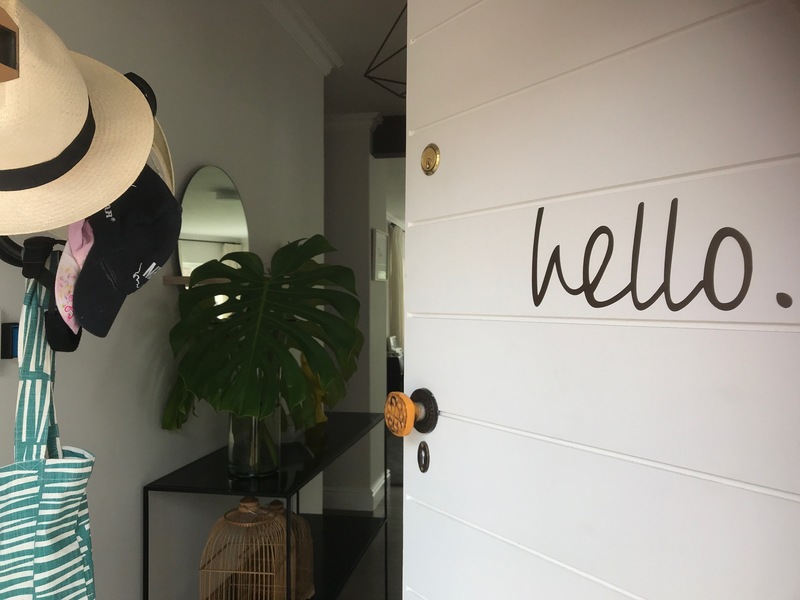 You can see from this shot that we painted the wooden window frame and replaced the door and painted it white too – goodbye brown!! Just so you can see that it really is a teeny little space. The open space looks into our office and in time and when budget allows we will get a black industrial style window there to marry the lines of the server and the light. 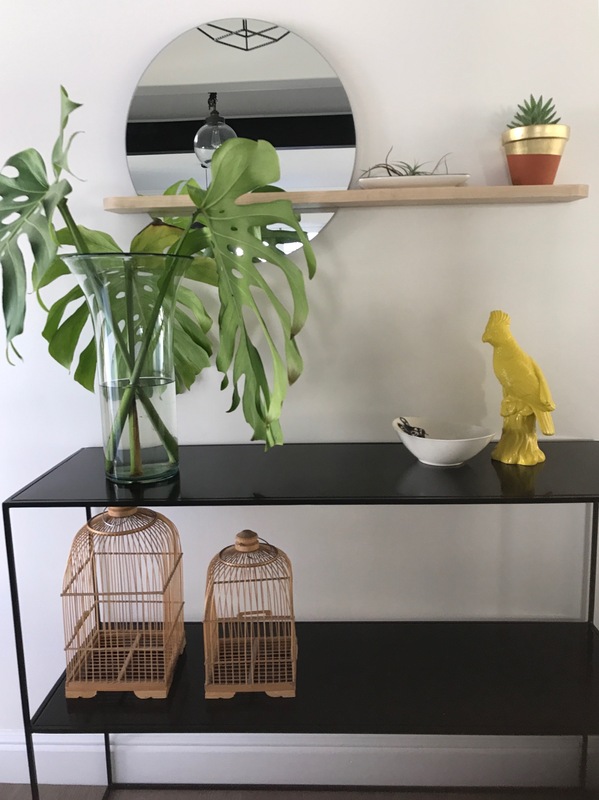 The parrot is a MrP buy from a few years ago – the bunny bowl was a gift from my friend Leigh-Anne who passed away – i find myself wanting to use and display the things she gave me more and more at the moment. I got the cages from my friend Chloe on the weekend (she is decluttering at the moment – score for me), the Delicious Monsters are from my garden and my friend Suzie gave me that Ngwenya vase for one of my birthdays in my twenties and i’m so proud its survived all this time and all my moves. 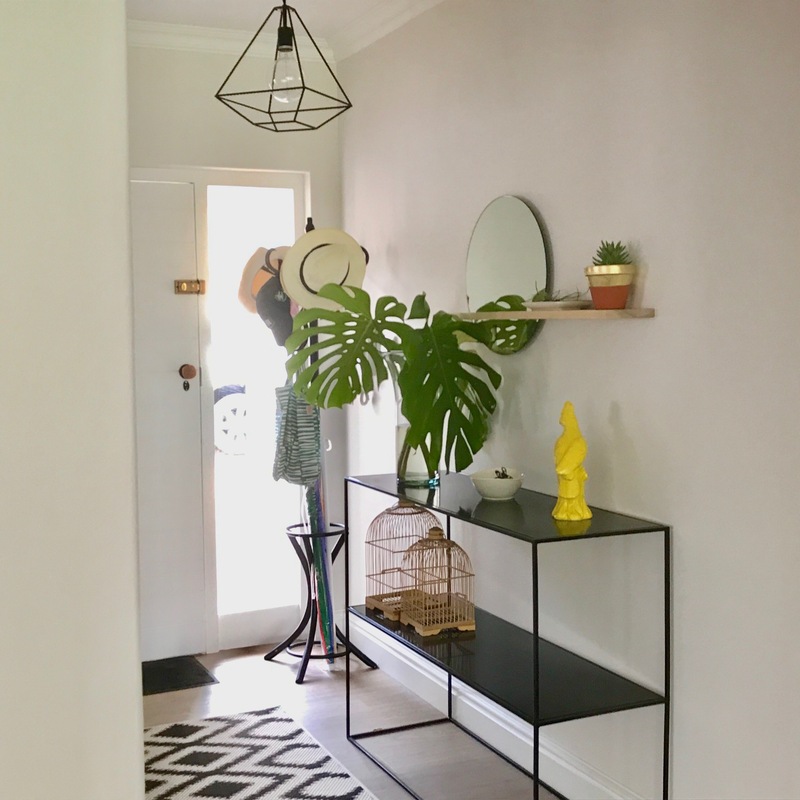 So there you have it – an entrance hall that is small but has place for dumping stuff if you need to, performs a definite function and visually, i think its pretty clear what the zone is designed to ‘do’. It’s still a little plant heavy but i haven’t found exactly the mix of plants and decorative details i want for it – so air plants (from Stodels) and succulents it is! What do you think lovelies? Well you sure have a way of converting plain to loveliness! Such a clever use of space! And loads of personality in the mix too…..love it. So stylish and original – well done! Total makeover! You have such a good eye for details. Love the clean lines and modern take.